There were many makers of trunks in the United States between the early 1800's to the early 1900's, and a wide variety of trunk types and styles. Below are pictures or a variety of trunk styles and approximate ages for reference. If you see a trunk style that you are interested in aquiring please email and we will let you know if one is available from our stock or unrestored or restored trunks. Saratoga Style Humpback, circa 1880s. Large, rustic, dark pine and hardwood slatted trunk, original brass lock dated 1877. Size: 33" L X 26" H x 21" W.
Flat-top 1860s Pine Trunk, Built solid trunk with heavy pine, original iron bands, slats, and hardware! Lined with attractive beige floral fabric with lift out tray! Fabulous little Doll Trunk, in all original condition. Wood trunk is covered in red canvas, has wood slats with fancy clamps, and brass lock. Size: 16 T, 9 tall, by 9.5" deep. Gold Rush/ Stagecoach Trunk, circa 1850s. 6 banded trunk with brass studs. Fancy brass lock. Original interior pine tray. Fabric lined. Size: 28"L x 16.5"H x 16"W.
Desk Trunk by Belber Traveling Goods, Philadelphia, circa 1890s. Solid brass lock, side handles, label on top, lined tray, oak drawers with brass pulls. Size: 30"L x 25.5"H x 14"W.
Circa 1890 Pine Trunk, 3/4 Size!, Hardwood slats, has all original hardware and lock, and great all wood original tray! Lined in blue floral fabric in top and bottom of trunk. Size: 26 L 19 T, X 18D. Brass Bound Stagecoach Trunk, circa 1870s. Small pine, brass banded trunk with slats on top, brass bands and pewter colored studs. Curved top. Iron lock, Size: 24"L x 12.5"H x 13" W.
Jenny Lind Trunk - Child Size, Ca. 1860s. Original tray, lid compartment, and large maker's label. The wood is thick, and has beautiful color. Original iron bands, large brass "buttons" and iron / brass lock. Measures 24" x 14" tall x 15 1/2" deep. Unusual 1870's Round Top Trunk Unusual trunk from the 1870s period. Thick, dark pine with hardwood slats, original bottom rollers, lock with KEY, original metalwork and hinges. Unusual because of the many brass studs and the metal trim is different from most trunks. Trunk measures about 33" wide x 22" tall x 18" deep. Rare Jenny Lind Child's Trunk, Ca. 1860s The five iron bands and large brass "buttons" original. The trunk has the original bottom iron rollers and fancy brass lock plate. The interior is lined in nice blue rose/floral pattern fabric and there is an old fashion picture in the lid of a girl with flowers. It measures 26 1/2" by 14 1/2" tall by 13 1/2". Fabulous Oak Slat Trunk CA. 1880s The oak has been carefully refinished with a smooth satin finish. The lock is solid brass. The handles are heavy stitched leather and the front leather straps are replaced exactly as the originals were made, using the original buckles! (something most restorers don't do). The trunk measures 28" x 19" tall by 17 1/2" and comes with an inner tray. Rare French Goyard Trunk, Ca. 1900 This trunk features LOTS of solid brass hardware (all cleaned and lacquered), including handles, hinges, locks, braces, etc. The front opens up and the top lifts up. The interior is original, with two top pull out drawers (with original leather pulls marked "Goyard")! The top lining is silk! The trunk has its original bottom rollers. 32" tall by 23" wide by 19" deep. Great 1860's Camel Back Trunk, This early trunk has many wonderful features.. It dates from the 1860s - 1870s.The style of the trunk and the front leather closing straps are 1860s - 70s. The lock is solid brass and has the original working key! All hardware, hinges, buckles, & rollers are original. The interior pine tray is original! The inner lid has a fabulous colorful paper lining and large picture, titled "Der Kleine Jager".. 33" wide by 22" tall by 18". Round Top Immigrant Trunk, circa 1880s. A nice pine trunk with unusual design, two iron & brass locks, 3 vertical slats with fancy metal trim, iron bail handles, lined interior & tray in greens & off-white floral print fabric. Size: about 36"L x 22"H x 22"W.
Flat Top Trunk, Circa 1890's Beautiful wood trunk made of heavy pine with oak slats which dates from the 1890's to 1910 period. The size is great and very functional for uses such as side or lamp table, etc. The size is 34" X 21 3/4" x 19". It has all the original hardware, latches, lock, bottom rollers. The handles original. The finish is hand rubbed, waterproof, satin-gloss tung oil. The interior has a lift out tray lined with a dark blue floral print fabric. Rare Size Flat Trunk, CA.1900 This knotty pine and hardwood slat, Flat Top trunk is 35" x 18" tall x 15" deep. It is an unusual long and narrow size. The wood is beautiful and very thick/strong. Brass label on top that has "Manufactured by Manning Bros. Trunk Factory 206 No. 5th St. Springfield, Ill." Handles are replaced with original style heavy stitched leather. All hinges, metal trim, lock, and catches are original and in excellent condition. Three slats on top and one on each side. Interior is nicely lined in a blue print fabric and has a lift out tray. Civil War Period Half Trunk It is from the 1850-1860s period, has all it's original brass buttons, lock, and interior tray. It is really a beautiful little trunk, measures 17" by 17" by 17". The interesting brass lock is marked "Eagle Lock Co." with an eagle emblem on it. It has the key too! Eagle made locks for many early trunks beginning in the 1840's up in Terryville, Conn. The leather handle and lift strap have been replaced as original. The hinges are original and in great shape. The wood is pine and is very beautiful with a smooth satin finish. The interior wooden tray is original and has been re-webbed as it was made. The new fabric lining is in blues with a small floral print, similar to the paper which originally lined the trunk. 1880s Half Trunk - Rounded Top, This beautiful and rare style Half Trunk is of the 1880s period. It has thick solid wood (pine with oak slats) and is finished in a rich walnut color. 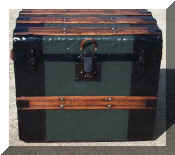 It is a very sturdy and strong trunk with all original hardware, lock (no key), catches and handle caps. The handles are heavy stitched leather reproductions of the original style. The trunk measures 20" wide, 20" tall, 16" deep. There is a lift out tray and the interior is professionally relined in quality cloth of blue and off- white floral design. Flat Top 1870s Trunk This is an excellent early flat top trunk which would make a great coffee table, side or end table. 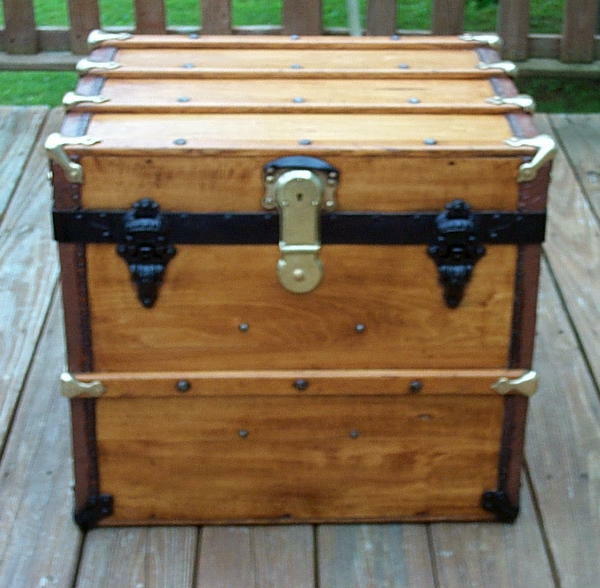 This sturdy trunk has very thick wood and all the original metal trim and hardware, including brass trim on the wood slats and fancy shield shaped handle holders. The trunk is quite a hard type to find for this period from late 1860s to 1870s. The size is 28" by 17" tall by 17" deep. The leather fastening straps on front and side handles are replaced just like the originals, using the original front buckles and brass studs to attach the straps. The wood is very nice and solid with only a few small age cracks which have been glued and filled. The finish is a smooth waterproof satin tung oil finish. The interior has it's lift out tray and is lined in a multi colored floral fabric. 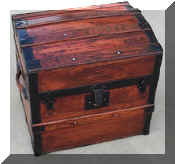 1890's Flat Top Half Trunk Here is a wonderful flat top "half trunk" from the 1890 - 1910 period. It has great solid brass slat bumpers and lock (no key). The Solid brass hardware is very unusual, it has been polished and lacquered! The trunk size and shape is rare and hard to find. It has the original divided inner tray which is lined in a nice antique scenic fabric. Handles are replaced with heavy stitched leather handles. Has fancy working front latches and all original hardware and trim. The wood is in excellent condition with no cracks or damage, oak slats, and a smooth satin finish. Great as an end table, lamp table, etc. We rarely get these flat half trunks. Size is 22" wide by 20" tall by 18 1/2" deep. 1890's Half Trunk, This nice Half Trunk is strongly made of solid wood covered with embossed metal covering and hardwood slats. It is from the 1880-1900 period when embossed metal was widely used on trunks. There are 4 slats on top and one on front and back. This has all the original hardware, hinges, catches and lock, new heavy stitched leather handles, a lift out tray and the original old color picture in the inner lid (see photo). The colors are spruce green and black, with a beautiful multi-green fabric lining. Trunk measures 22" wide x 17" deep x 20" tall, a hard size to find! This beautiful pine trunk with oak slats measures 31" wide, 19" deep by 22" tall. It has all original hardware, unusual catches dated 1878, bottom rollers, fancy handle holders, and the original wooden sectioned tray! The trunk is lined with a nice floral blue fabric, ready to store your treasures. There is an old style print in the lid of a girl with flowers in her hair. The wooden bottom is in excellent condition and very clean. Has new heavy dyed leather handles and lifter. There is a crack in the wood across the back side of the lid, but it isn't really detracting from the appearance of the trunk and you don't see it when looking at the trunk from the front. The top piece of the lock is missing, not hurting the looks but I have adjusted the price down for this. (last one similar sold for $675) Still a very attractive camel back trunk from the 1870s period. Theatrical Dresser Trunk, Ca. 1900 This beautiful and rare trunk was made by F.A.Stallman, Columbus OH. The trunk was made very strong and solid with extra heavy hardware. It is pine with hardwood slats and measures 36" x 24" tall x 22" deep when closed. The front lifts up to form a dresser with three wooden drawers, three small lower compartments and a top fold down compartment, with a small beveled mirror. The trunk is complete and all the latches and drawers work well. Some portions of the interior have been cloth lined with a multi-colored floral print. The handles are replaced as original style. There are large original rollers on the bottom of the trunk which is very clean and solid. A very useful and unusual trunk, a real conversation piece! This beautiful Victorian half trunk is made of thick dark pine and heavy oak protective slats. It measures 20 1/2" wide, 19" tall and 17" deep. It is totally complete with the original working latches, lock (no key) dated 1879, iron sheet metal trim, interior tray, and a beautiful Victorian print inside the lid. The handles are replaced with heavy, stitched leather handles just like the originals. The bottom is metal covered, very clean and repainted. The wood has very nice wood grain and a smooth, satin finish. The top is slightly rounded in shape. The interior was cleaned and relined with fabric with a blue and green vine/floral pattern. The wood is in excellent condition without cracks or damage, just the original joint lines between boards. A wonderful little trunk that would go well in so many places in your home.